the Bugatti revue contest 2002: Stories! "To race is to live. All the rest is simply waiting ." Alice came to racing through her first husband, Freddy Hoffmann, son of the founder of Hoffmann-LaRoche, the drug manufacturer. 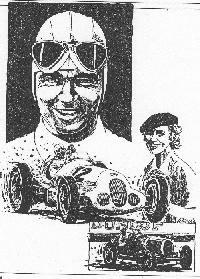 Freddy owned a spark-plug factory and used a racing team to promote the plugs. He was a close friend of Ettore Bugatti's, whose cars were state of the art in the spring of 1925, so he bought one and hired a promising young Frenchman, Louis Chiron, to drive it. Chiron was sent around to the Hoffmann apartment in Paris to pick up the car keys. Young Mrs. Hoffmann opened the door. "In the late Twenties... racing was more man than factory, and drivers were great friends. We had marvelous fun chasing each other on the roads from one circuit to another, playing tricks all the way. I was so happy to be part of it all." "So began my passion for driving. Once I drove very fast from Paris to Monte Carlo nonstop in a Type 35B supercharged Bugatti. " The 1926 German Grand Prix was won by a young German no one had heard of. On the fifth lap it began to rain, and Dr. Porsche, Crown Prince Otto, and the vast crowd witnessed the birth of a legend. Instead of slowing, the unknown Mercedes driver began to catch and pass and then leave behind a strong international field. Rudi Caracciola, 25, even had time to stop and change the plugs. Some who saw it swore he suspended the natural laws of visibility and adhesion. He invested the 17,000-mark prize in a Daimler-Benz showroom on the Fifth Avenue of Berlin. Then he married Charlotte, daughter of a wealthy Berlin industrialist. Charly, they called her. She was tall and fair and beautiful and loved him better than a man of his years and ambition could know. It was at the 1928 German Grand Prix, which was won by Caracciola, that Alfred Neubauer, the Mercedes team manager, met Louis Chiron. Chiron, too, was a hotelier's son, frm Monaco. He was in the company of a woman whom Neubauer described to Caracciola as one of the most beautiful he had ever met. Her name was Alice Hoffmann, but in the Bugatti pits they simply called her Baby. She had been born in Hartford, Connecticut, to a Swedish mother and a German father. She lived in Paris, Neubauer said, spoke five or six languages, and you couldn't tell which was her mother tongue. She ran the Bugatti team for her husband. Chiron was her star driver. "Thy Marriage to Freddy was over," Baby wrote. She may have known that, but Freddy didn't, and Chiron's feelings were probably mixed, given his reputation as a ladies' man. Before anything was decided, they went to the Eifel Mountains and the Nurburgring for the German Grand Prix. There, things took a turn when, during the race, Charly Caracciola, who was timing for Mercedes, appeared in the Bugatti pit and told Baby to slow the boys down because the Mercedes SSKs were having trouble and weren't going to last the race. Baby did and the Mercedes fell out, and Chiron won gloriously. It was the life Baby had so often spoken of. They were in their prime, Rudi and Charly, and surely no two people had a better summer, spent in the company of better' friends: Baby and Chiron. Through all Europe they played. Their youth and vigor, their happiness and mastery, were the envy of all they passed among. They were the toast. There might be more illustrious summers ahead, summers of greater victory and wealth and fame, but never would there be such a perfect balance. In 1934, Chiron was cut adrift from Bugatti and replaced by the French comer Rene Dreyfus. Since both he and Caracciola were out of work, Chiron suggested that the four friends form a team together. Buy a pair of P3 Alfas, and call themselves "Scuderia C.C." (Caracciola-Chiron) .Charly and Baby were delighted. They would be together always. On February 2, 1934, Rudi persuaded Charly to spend the day skiing with friends. He remembered the day, spent alone in the cabin, waiting for her return. He remembered how sharply he had missed her. At five, the train arrived without her. Something was wrong. At nine o'clock, a young mountain guide arrived at the chalet and told him the news. There had been an avalanche. The ski party had been buried. All were dug out alive, except Charly. She had died of a heart attack. Baby was skiing in Austria with Chiron and two other drivers. She and Chiron left immediately. Their patience, day after day-- Chiron's humor and spirit, Baby's tenderness-seemed infinite. Gradually, Caracciola emerged from his depression. At the end of the season Bugatti and Maserati gave up. Winter saw Caracciola, Chiron, and Baby spending a good deal of time together. Baby's marriage to Freddy had been annulled, and she and Chiron shared a flat in Paris. They divided their time between there and Monte Carlo, along with some skiing in Switzerland. In Paris one day, Caracciola summoned the courage to tell Baby: "If I could find a girl like you somewhere, I'd marry again." Baby laughed and told him to go off and find himself a nice young girl. In 1937, Caracciola, calling from Berlin, proposed to Baby for the third time. Baby called Rene Dreyfus in Paris one night and invited him for dinner--but without his wife, Chou-Chou, who was Baby's close friend. "When I arrived," Dreyfus relates, "Louis (Chiron) wasn't there either, and Baby was packing." "I'm leaving Louis," Baby said. "I'm going to marry Rudi." Dreyfus told her she was making the right decision and that he would drive her to the station in the morning. Baby told him then that she had put a condition on the marriage; it must have Chiron's blessing. At dawn on the morning after she left for Berlin, there was pounding on the door of Dreyfus's flat. It was Chiron, "madder than I have ever seen him," Dreyfus recalls. "How could she do this to me?" Chiron screamed incredulously. Dreyfus pointed out to his old friend that it wasn't his wife who had run off, as had Freddy Hoffmann's. But Chiron "left as angry as he came, and stayed angry." Baby cabled Chiron from Berlin, asking for his approval. The reply was swift; a cable reading, "Baby is old enough to make up her own mind." Rudi and Baby were married, in June 1937. With Baby back in the pits, Caracciola was a new man. Of all of them, Caracciola perhaps was least affected by world war II, spending it in retirement with Baby in the villa he had built her, as he promised, in the country above Lake Lugano in neutral Switzerland. The heydays of their lives were the history of racing.